The video is double speed. The winner, Sean McKenna, crosses just after the title fades. Benjy (Wiz & Lorna’s golden lab) provides some entertainment while awaiting more finishers. Please note the video is double speed and lasts about 11 minutes. The Grantchester Charity Runs were able to hand over their ‘cheque’ this afternoon at the Addenbrooke’s Charitable Trust’s Supporter Celebration Event. …Winners of the inaugural Grantchester Charity Runs Team competition! The prize is bragging rights for an entire year and a donation to the Charity of their choice. 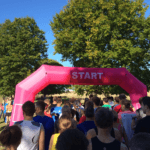 Congratulations to our 2016 Grantchester Charity Runs Winners!